Yes, nothing says “SCIENCE” like shortening half the bristles on a broom. Brushoff? 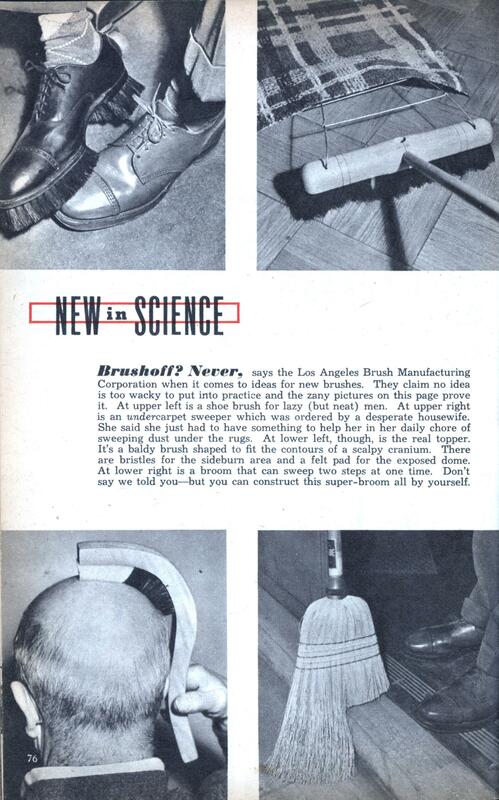 Never, says the Los Angeles Brush Manufacturing Corporation when it comes to ideas for new brushes. They claim no idea is too wacky to put into practice and the zany pictures on this page prove it. At upper left is a shoe brush for lazy (but neat) men. At upper right is an undercarpet sweeper which was ordered by a desperate housewife. She said she just had to have something to help her in her daily chore of sweeping dust under the rugs. At lower left, though, is the real topper. It’s a baldy brush shaped to fit the contours of a scalpy cranium. There are bristles for the sidebum area and a felt pad for the exposed dome. At lower right is a broom that can sweep two steps at one time. Don’t say we told you—but you can construct this super-broom all by yourself. Paratechnican is a new heavy equipment container which can be fitted to an aircraft to enable payloads to be dropped without dispersion. Eight parachutes were used to lower this three-ton blister which carried a six-pounder gun and a jeep. Improvements may soon make room for crews for equipment, too. Radar Clocker gauges the number of vehicles which pass the traffic signals in a given time on New York City streets. It’s part of a Traffic Planning Department scheme to establish speeds currently maintained by vehicles on city streets in order to set new speed limits and regulate lights to avoid congestion. Magnet Master is a cross between a construction set and an art portfolio. It consists of permanent magnets plus slotted steel parts. The magnets hold the steel pieces together and no matter how intricate or abstract the result, it can be taken apart in a moment. The two young ladies below are designing interesting models. Anne Louise Sundell, far left, isn’t sure what she’s making but Leslie Ann Stuart insists hers is a sugar factory. Anne’s model, right, turned into a water tower. Or something.